If you LIKE this post, please share it or pin it or repin it on Pinterest. Entenmann’s is celebrating this Valentine’s Day with the Entenmann’s Sweet Valentine’s Edible Bouquet and Entenmann’s Sweet Donut Sweepstakes. Entenmann’s fans won’t want to miss out on this mouthwatering celebration! 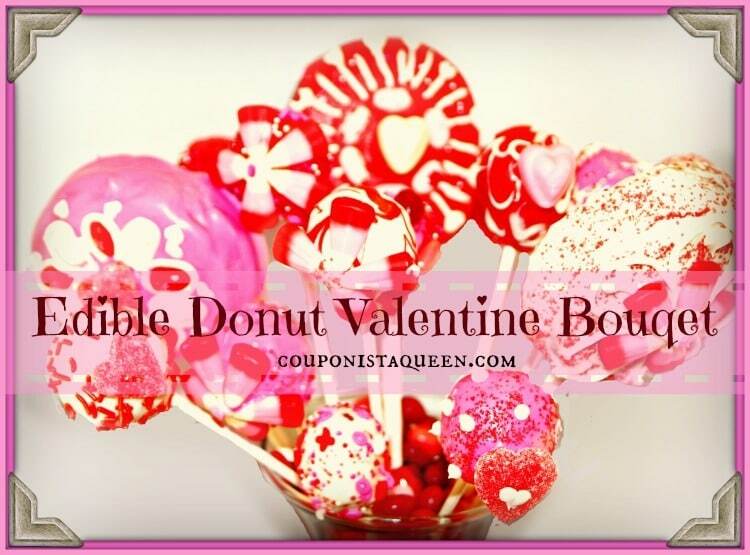 Entenmann’s provided Couponista Queen with funds, coupons and supplies to make my own Edible Donut Bouquet, and it was a lot of fun. My mom came over one evening to see the baby, so Ava supervised us while we made the bouquet. It took less than an hour and we thought the results were pretty awesome. Here is the idea photo from Entenmann’s. How do you think we did? If you want the recipe card to make this donut bouquet, enter the Entenmann’s Sweet Donut Sweepstakes on the Entenmann’s Facebook page through February 27, 2014 for the chance to win lots of prizes, including Entenmann’s coupons, Mr. Rich Frosted and Ms. Crumb plush toys, 1-800-Flowers arrangements and more! Details can be found on Facebook.com/Entenmanns or on 8-pack boxes of Rich Frosted Donuts and 8-pack boxes of Crumb Donuts. After you enter you will get the recipe card. Make sure that you are careful when dipping the larger donuts as they will be heavy. 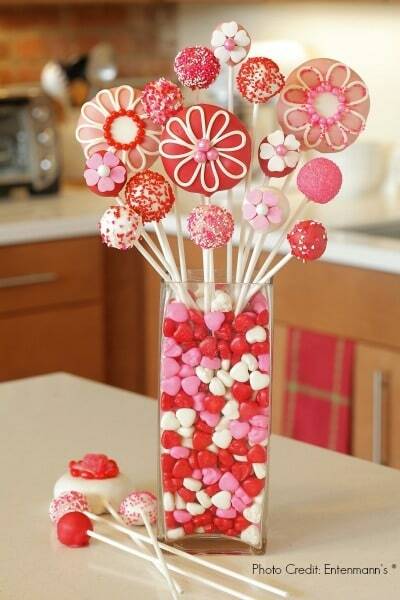 We used 2 lollipop sticks in the larger donuts to make sure they were secure when we put them into the vase. Make sure the sticks are in both sides of the donut (through the bottom then the center hole then into the top). To cover the sticks showing in the center hole, I cut a Pop’em donut in half and used melted chocolate to glue it in the middle. I did this before I dipped the entire donut so it would be smooth. You will need to chill the donuts before dipping them and after dipping them. Since it is so cold outside, we sent the King outdoors for a few minutes with the tray rather than try to fit them into the freezer. If you don’t want to make the whole bouquet, or if you want treats for many people, just make the little Pop’ems and wrap them individually with some small cellophane bags and ribbon. Viola, you will have the perfect little Valentine’s to give out at work, school, etc!